It sure is the end of August. Yes, three new movies were released this weekend, but none of them will really make a blip on the radar. On the other hand, we do have a big, Big, BIG story happening to close out the summer. And boy is it ever a great one. That great story belongs to Crazy Rich Asians, a movie that I've already seen twice and would readily go see again, quite honestly. 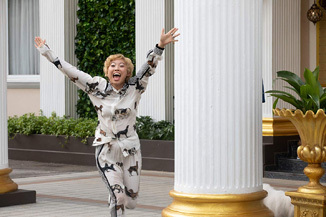 A wonderful rom-com that emerged from a desert of terrible, trite, disappointing movies in the same genre, Crazy Rich Asians did wonderfully well last weekend with $26.5 million (and $35.3 million in five days). You might have wondered how much it would have been propped up by the amazing reviews and word-of-mouth. Well, wonder no more. This movie is special. After amazing weekday numbers, Crazy Rich Asians is likely to do something unheard of this weekend for a movie that debuted in 3,000 theaters outside the Christmas season. It's going to have a single digit drop. And in fact, it might even increase. I'm not going to count on that happening, but it certainly is possible, because Crazy Rich Asians earned a magnificent $7.3 million yesterday. That is a decline of less than 4 percent from last Friday's total. Various news sites are reporting that a lot of folks are like me, going to see the film multiple times. And it's also getting demographics into the theater that simply don't usually attend. For the weekend, I'm going to forecast a $25 million total, which would be the tiniest of tiny drops. But do NOT be surprised if we see an increase. Warner Bros. isn't usually conservative with their estimates, and this would be a really nice feather in their cap. Either way, Crazy Rich Asians is one of the best box office stories we've had in ages, and a welcome one at that. It's nice to see quality and diversity rewarded. The rest of the story for yesterday isn't so hot. We've seen the "bad" puppets premise work from time to time. The "Smile Time" episode of the Joss Whedon television series Angel comes to mind, and the Tony Award-winning musical Avenue Q managed to get it right, too. Not so for Happytime Murders, a critically reviled Melissa McCarthy film that tries to turn the Muppets formula on its head. Alas, despite being directed by Jim Henson's son Brian, the film managed just 22 percent positive reviews at Rotten Tomatoes and has a C- Cinemascore from audiences. As Jay Cutler said about a second season of his wife's show Very Cavallari, "Hard pass."